Of the many Aylmers who have had a significant role in religious life, the most prominent was surely John Aylmer, Bishop of London to Queen Elizabeth I, from 1577 to his death in 1594. John was born in Norfolk in 1521 or possibly 1520. Birthplace, however, is a subject of some uncertainty. Wikipedia, bless it, has the birthplace as Tilney St Lawrence, a village of north Norfolk, south of the Wash, and these references give the place of birth as Aylmer Hall in that vicinity, this having been the family home for generations. Another possibility is the nearby Tilney All Saints. There may be a stronger claim for Tivetshall St Mary in south Norfolk, north of Diss. 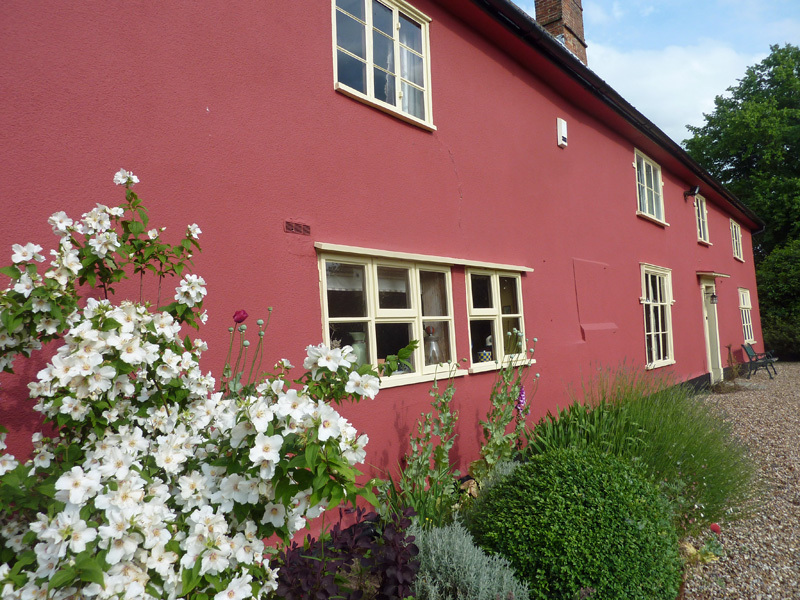 The presently-named Walk Farm was until the early twentieth century known as Aylmer’s Hall, and had been since it was built in the late fifteenth century. The Cambridge alumni database, which present resident of Walk Farm Liz Chubbock has researched for me, states his birth place as “Aylmer Hall, Tivetshall, Norfolk”. The Oxford DNB has him as “descended from the Norfolk branch of an ancient family long established in Tivetshall St Mary”, though this is not quite the same as saying he was born there. 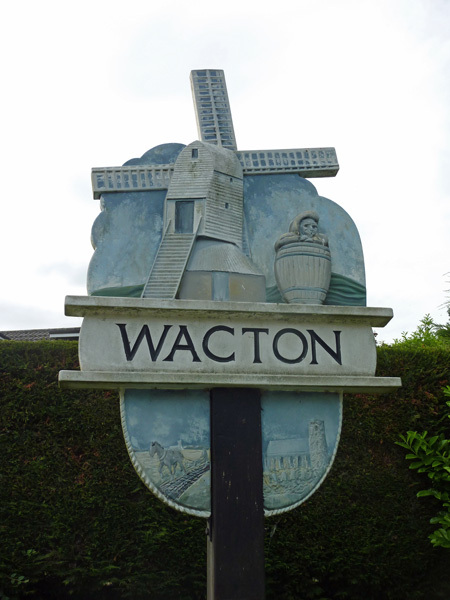 But to confuse matters even more, a local history group in Wacton, the next parish north of Tivetshall St Mary, tell me of village ‘folklore/myth/legend/story/fact’ of his birth at Wacton Hall, though “this may not have been grand enough to have been the dynastic home of a wealthy family”. This too changed its name – from Aylmer Hall, this time – in the twentieth century, at least as recently as 1906! 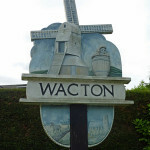 Maybe Nortfolk villagers got tired of spelling Aylmer … The Wacton village sign commemorates him, encased in a barrel – perhaps a refernce to his exile, see below. Wherever, he would have been baptised at the local church, but which one is therefore a matter of some speculation. He studied at Queen’s College, Cambridge, and in 1549 became tutor to the 12-year old Lady Jane Grey, later famously to be Queen of England for nine days. She found him the opposite of her strict parents; he, some say, fell in love. John became Archdeacon of Stow, Lincolnshire, in 1553, but like many non-Catholic churchmen fled to exile during Queen Mary’s reign. Here he lived principally in Strasbourg and Zurich. 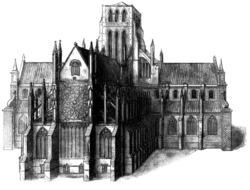 Returning after Elizabeth’s accession in 1558, he soon became noticed, and secured the Archdeaconry of Lincoln in 1562. 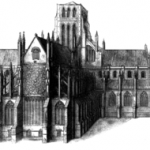 Lincoln was (and is) a major diocese, and with his undoubted intellectual abilities and appropriate (for the time) religious certainty, promotion may have been no surprise. John Aylmer became Bishop of London in 1576. It seems alas to have been an over-promotion. The fault was not in his intellectual capabilities: he was a talented linguist and a formidable logician, and when challenged as misappropriating church funds he marshalled all the books in perfect order to defeat the argument. As the Dictionary of National Bibliography admits, John “deserves to be commended for his attachment to learning and for his discerning patronage of scholars”. He seems to have recognised that his personality was overstretched, and tried to escape to the quieter sees of Ely, Winchester, and Worcester (the latter at Elizabeth’s personal request), but to no avail. Yet John’s significance to the still-young Protestant state can hardly be under-estimated. Militantly anti-Catholic, he has been reported as “[assigning] to Queen Elizabeth the messianic task of destroying Antichrist in Britain”. (See the Alchemy website). As one of the commission that examined whether England should adopt the Gregorian calendar, as had the rest of Europe, he was influential in ensuring that it would not do so for another two centuries – apparently, because English Protestant theologians could not countenance adopting a measure approved by a papal bull. John married Judith Bures, of a notable Suffolk family, and with her had ten children. One (unnamed) daughter made an apparently unsuitable match in Adam Squier, a Staffordshire rector, who John made Archdeacon of Middlesex – another case, it seems, of ecclesiastical over-promotion. 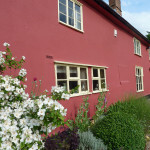 (See the records of the Cumnor Historical Society). Another daughter, Elizabeth, made it seems a better match in Sir John Foliot, of Pirton Court, near Pershore in Worcestershire. Through them ‘Aylmer’ persisted as a Midlands forename – it is an area with few Aylmer connections otherwise – for example their son Aylmer Foliot (picture 3, age 15), later of Blakesley Hall, Yardley, Warwickshire. I am indebted to the Birmingham City library service for this information. Another son, Edward (1609-90), studied at Oxford and was known to have lived in America. A further American link comes from my US correspondent Lena Elmer, a descendant of Bishop John through his son Theophilus. Edward Elmer (note the corruption), the eighth son and fifteenth child of Theophilius, came to the new world on the ship Lyon with his wife and two children. Bishop John was buried at St Paul’s Cathedral, and granted an inscription (no longer visible) that gave no praise.